Is running your small business getting tougher? The recent changes to independent contractor law affect only a handful of states (California, New Jersey, Massachusetts, Illinois.) But chances are they will impact independent contractor law in most, if not all states before long. What is independent Contractor Law? And why does it concern you, a nurse practitioner practice owner? But first, we’ll take a step back and look at the big picture. Most businesses need staff to take care of day-to-day operations; that’s why the majority of businesses need to hire employees. But there is another type of worker utilized by companies: independent contractors. Typically, they work on their own behalf, as a standalone business. Independent contractors most often get called in because they bring a unique skill set to the table. While some companies have always utilized independent contractors, it’s a growing trend growing today. By tapping into the pool of independent contractors, companies benefit in many ways. As mentioned earlier, independent contracting or freelancing is a growing trend: more and more companies utilize it. And there’s an equal number of people working as independent contractors or freelancers, across all fields and industries. Just think of companies like Uber, Lyft, Upwork, Fiverr, Freelancer, or Textbroker. These are just a few examples of job boards and on-demand transportations services. We even have a name for it. We call it the “Gig Economy.” There’s been an enormous increase in freelance work and short-term opportunities as compared to the stable jobs of the past. Independent contracting works for both companies and contractors, at least most of the time. Unfortunately, in the future, it may be more challenging to work as an independent contractor or to hire one. To qualify as an independent contractor, there are specific rules that must be met. Rules are outlined by the IRS on the federal level and by individual states, on the state level. You as a business owner must determine whether a person providing services for your company is an employee or independent contractor. If the worker is an employee, you are required to withhold income tax, withhold and pay Social Security and Medicare tax on wages paid, and file all required reports that go with it. This applies to both federal and state payments and reporting. If the worker is an independent contractor, you are not required to withhold or make payments on behalf of the worker. You simply pay the worker the fee both of you agreed to. So how do you decide if the individual is an employee or qualifies for independent contractor status? I am not an attorney or accountant. The content in this article is informational only and is not meant to substitute qualified professional advice. “Behavioral: Does the company control or have the right to control what the worker does and how the worker does his or her job? As you can see, this is not exactly clear-cut, as acknowledged by the IRS itself. Some independent contractors may meet all three criteria, whereas others may only meet one or two. “Businesses must weigh all these factors when determining whether a worker is an employee or independent contractor. Some factors may indicate that the worker is an employee, while other factors indicate that the worker is an independent contractor. There is no “magic” or set number of factors that “makes” the worker an employee or an independent contractor, and no one factor stands alone in making this determination. Also, factors which are relevant in one situation may not be relevant in another. So, if you’re still not clear whether a worker is an employee or an independent contractor, you may file FORM SS-8 with the IRS. They will review all facts and make a determination about the worker’s status. 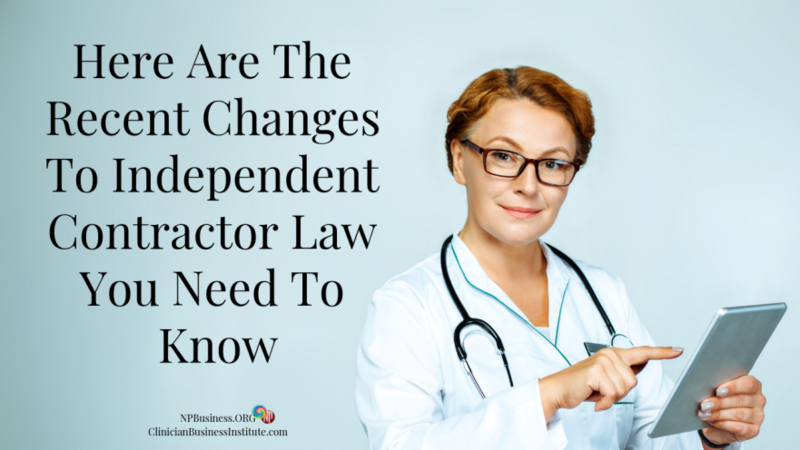 So now, what are the changes to independent contractor law you need to know? While the IRS still applies the guidelines described above, the California Supreme Court issued a ruling in May of 2018; it was the result of a class-action lawsuit. For more information follow the links at the end of this article. Free from control and direction of the hiring entity when performing the work. Perform work that is outside the usual course of the hiring entity’s business. Engaged in an independently established trade, occupation, or business of the same nature as the work performed for the business, evident through a legal entity, business license, and advertising. If you’re a Nurse Practitioner in California, working as an independent contractor, you will need to rethink your contractor classification. Because, unless you meet all three conditions, you no longer qualify for independent contractor status. The same applies if you own a practice and have independent contractor NPs working in your clinic. You must rethink and restructure how you work with non-employee workers. And California has made it clear it means business… employers will be fined $10,000 for violations. It would be wise to seek assistance from a qualified professional, to sort through your options. And I suggest you do the same if you’re in one of the three other states. This ruling affects employers and independent contractors alike. Sadly, many individuals will lose the opportunity to bring in extra income. And employers may see their cost of doing business go up; some may even be forced to close down because of it. But regardless, you cannot afford to ignore the new developments if you’re working in any of the four states. Please make sure you check your state law. If necessary, check with an attorney who is familiar with independent contractors and workers laws in your state before you HIRE a clinician for your practice. Please add your comments or questions below; we’d love to have your input!